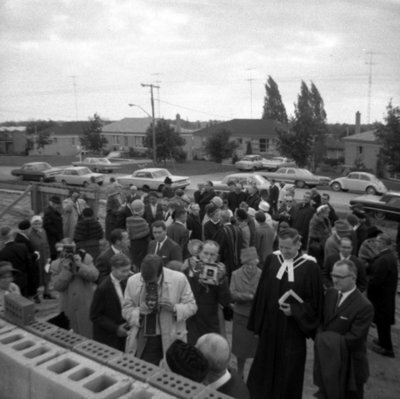 A black and white photograph of a group of people at the ceremony for the laying of the corner stone for the new St. Andrew's Presbyterian Church. St. Andrew's Presbyterian Church was built in 1859 at the north west corner of Byron Street and St. John Street in Whitby. It served as a Presbyterian church until 1968. In 1968 the new St. Andrew's Presbyterian Church opened at 209 Cochrane Street. In October 2010 the church celebrated their 177th anniversary. St. Andrew's Presbyterian Church, October 1, 1967, Brian Winter. Archives A2013_004_342.